I only have to wander a block away from my hotel on Cintra street to be in the midst of Chinese shophouses, tailors, and preserved food stores. After attempting to get measured for a bridesmaid dress by a Chinese seamstress, I decided that I deserved dim sum from the bustling restaurant across the street. 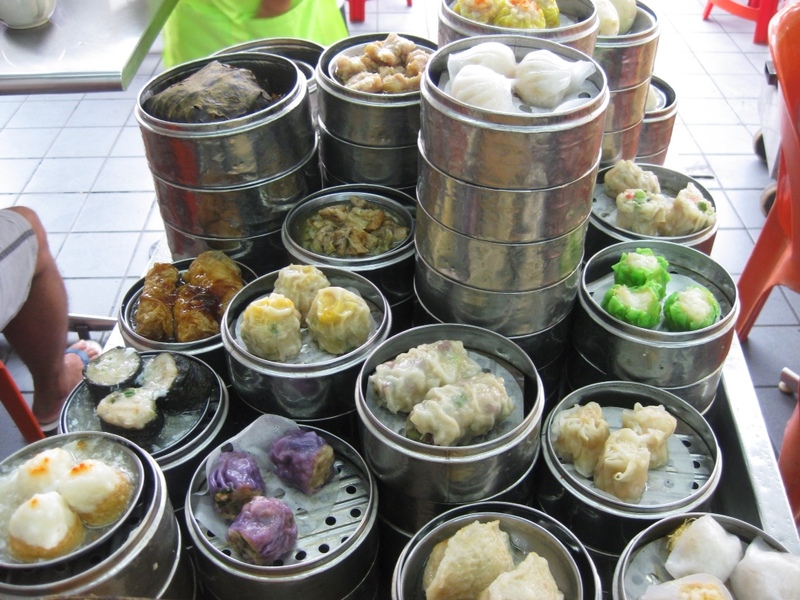 Three steaming stainless steel carts wheeled their way around the restaurant in a circle: the first had steamed dumplings, the second desserts, and the third pao. Obviously, I had to try them all. I let the woman pushing the dumping cart choose my dishes for me and I’m not 100% sure what I ate but it was all delicious. I’m pretty sure I had some kind of mushroom dumpling with fermented beans in brown sauce, a squid shu mai wrapped in a bright green noodle, and a fried egg wrapped triangle shrimp dumpling. Next was a sweet barbecued pork pao bun, followed by fried glutinous rice sesame balls filled with red bean paste for dessert. 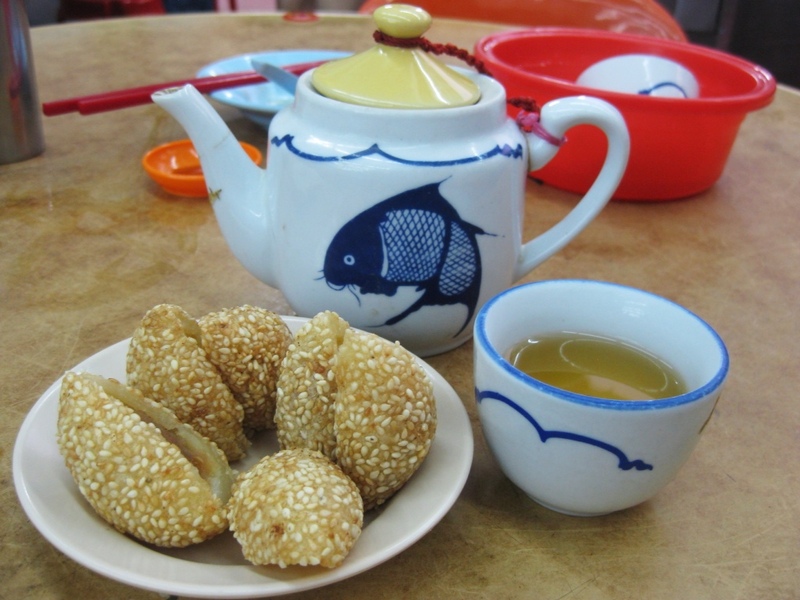 The sesame balls were the best I’ve ever had, and I hate to admit it, but I ate the entire order of three. I tried to convince myself that they were lighter than what I can get at home but the main justification was that they were really really good. So many dim sum options. So little idea what most of them are. How to choose? After dinner I walked around the dark streets, which alternate between being bustling with hawker stalls and completely dead and dark. Just as I got to one of the bustling corners the skies opened and it felt like I had just walked into a shower with phenomenal water pressure. Obviously, I didn’t have an umbrella. It never rains when you do. So as the street began to flood, I had no choice but to eat again in order to get shelter. Am I forcing a justification for a second dinner? I guess a little. 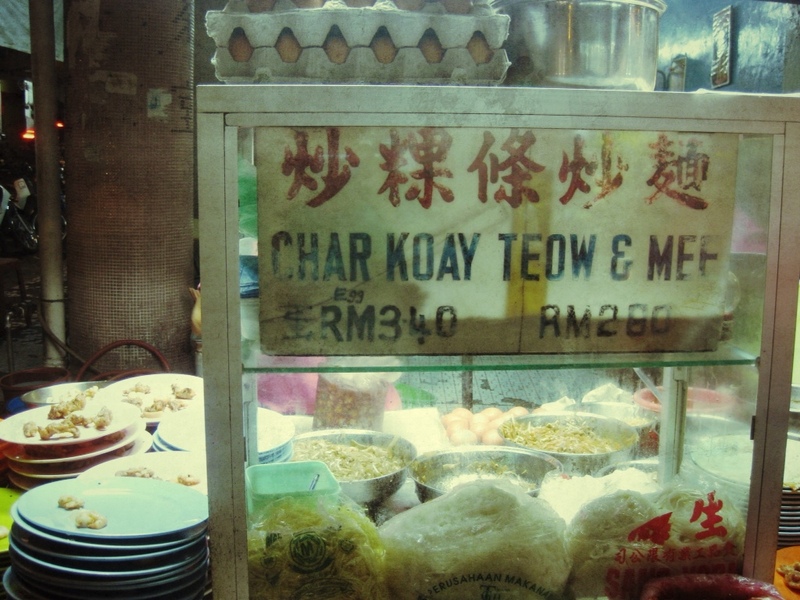 Dinner #2 was Char Kway Teow from a hawker highlighted in the street food book I had read through in Kuala Lumpur. This noodle dish is a hawker staple, as well it should be. It is a sweet, salty, and spicy combination of flavors and seafood served with a fried egg and slippery flat rice noodles. I learned how to make it the next morning in my cooking class with Nazlina and while the steps are not difficult, it is almost impossible to replicate the charcoal richness that a hawker stall brings to the dish. Good thing I stopped to get a point of comparison. 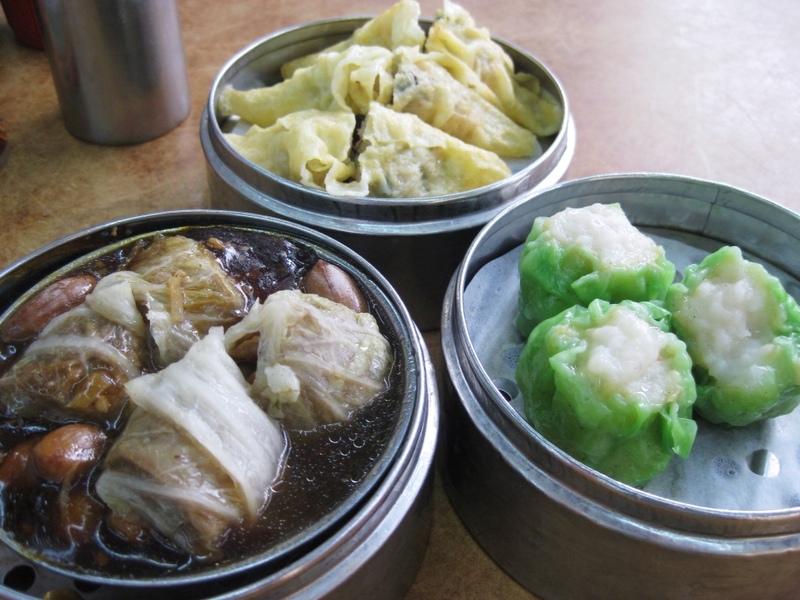 This entry was posted in Chinese, Dim sum, Dinner, Great deal, Malaysia, Malaysian, Penang and tagged Char Kway Teow, Dim sum, Malaysia, Penang. Bookmark the permalink.